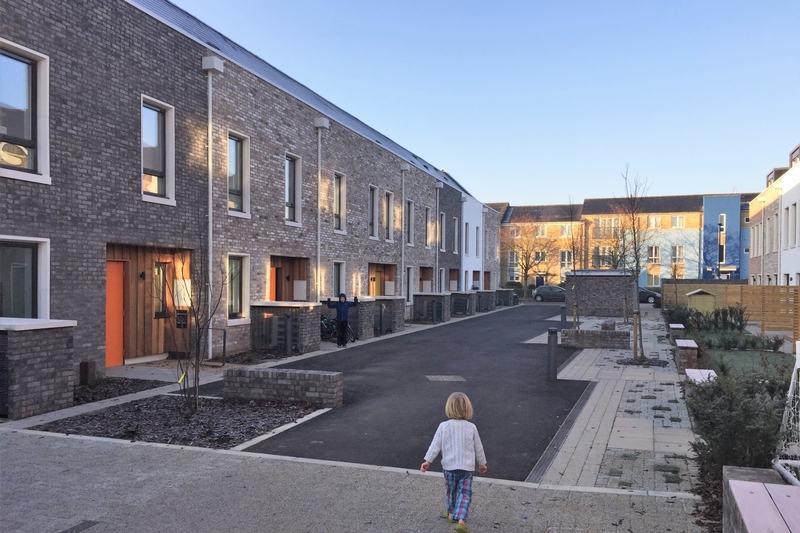 Completed in December 2018, this is the first chance to see inside some of the 42 community homes of the K1 cohousing project at Marmalade Lane in Orchard Park. After an introduction to the project and shared areas, visitors can each tour a home in a small group. There’s a variety of houses and flats, a common house for guests, with facilities for shared meals, an office, workshop and gym, plus a large shared garden. The highly insulated buildings have timber panel walls, made in a Swedish factory. Triple-glazed windows and doors were built into the panels to high standards of air-tightness. Wall, floor and roof U-values are around 0.18, so the homes have a low requirement for heating, which is provided by air source heat pumps. Internal air-quality is maintained by mechanical ventilation with heat recovery (MVHR). No gas is used on site, by choice of the residents, who can buy their energy (all electric) from 100% renewable suppliers. K1 have been planning their long-awaited homes and shared spaces for many years, with plenty of useful practice at joint decision-making. The resulting beautiful, practical spaces are a credit to the community and their build partners, offering an inspiring model for low environmental impact, sociable living. This community-build co-housing project was backed by Cambridge City Council, TOWN, Trivselhus and Mole Architects. NOTE: The tour of Marmalade Lane will take approximately 2 hours and refreshments will be provided. The tour will start at the Common House so please congregate there. It will be signposted on the day but it is also fairly recognisable as it’s the only building which doesn’t look like a home. After a tour of the common areas and heating system, you will break into smaller groups to tour one of the completed houses.